Molokai Born of volcanic eruptions 1.5 million years ago, Molokai remains a time capsule on the dawn of the 21st century. It has no deluxe resorts, no stoplights, and no buildings taller than a coconut tree. Molokai is the least developed, most “Hawaiian” of all the islands, making it especially attractive to adventure travelers and peace seekers. Modern Hawaii’s high-rise hotels, shopping centers, and other trappings of tourism haven’t been able to gain a foothold here. The lone low-rise resort on the island, Kaluakoi — a now-closed, empty hotel built 30 years ago — was Molokai’s token attempt at contemporary tourism. The only “new” developments since Kaluakoi are the Molokai Ranch’s ecotourism project of upscale “camping” in semipermanent “tentalows” (a combination of a bungalow and a tent) and an upscale 22-room lodge on the 53,000-acre ranch. The focus of both is on outdoor recreation and adventure, with all the comforts of home. Not everyone will love Molokai. The slow-paced, simple life of the people and the absence of contemporary landmarks attract those in search of the “real” Hawaii.Â This is a place where Mother Nature is wild and uninhibited, with very little intrusion by man. Forget sophistication, this is one of the few spots on the planet where one can stand in awe of the island’s diverse natural wonders: Hawaii’s highest waterfall and greatest collection of fishponds; the world’s tallest sea cliffs; sand dunes, coral reefs, rainforests, and hidden coves; and gloriously empty beaches. Exploring the “Most Hawaiian” Island — Only 38 miles from end to end and just 10 miles wide, Molokai stands like a big green wedge in the blue Pacific. It has an east side, a west side, a backside, and a topside. This long, narrow island is like yin and yang: One side is a flat, austere, arid desert; the other is a lush, green, steepled tropical Eden. Three volcanic eruptions formed Molokai; the last produced the island’s “thumb” — a peninsula jutting out of the steep cliffs of the north shore, like a punctuation mark on the island’s geological story. On the red-dirt southern plain, where most of the island’s 6,000 residents live, the rustic village of Kaunakakai looks like the set of an old Hollywood Western, with sun-faded clapboard houses and horses tethered on the side of the road. Mile marker 0, in the center of town, divides the island into east and west; an arid cactus desert lies on one side and a lush coco-palm jungle on the other. The defunct Del Monte pineapple town of Kualapuu is rising again — only this time, coffee is the catch, not pineapple. Located in the cool foothills, Coffees of Hawaii has planted coffee beans on 600 acres of former pineapple land. The plantation irrigates the plants with a high-tech, continuous water-and-fertilizer drip system. You can see it all on the self-guided walking tour or the Morning Espresso Tour, which is lead by a guide from the plantation and gives you a tour of the sorting facility and processing procedures. The less physically motivated should try the Mule Drawn Wagon tour, great for a family. The 2-hour tour is lead by a guide and two mules (Moana and Leila or Lilo and Loke) through the coffee fields and around the reservoir. Afternoon hiking adventures include a 2 1/2-hour hike through the coffee fields to the top of Kualapuu Hill for a terrific view of Molokai. The Plantation Store sells arts and crafts from Molokai. Stop by the espresso bar for a Mocha Mama, an intoxicating blend of coffee, ice cream, and chocolate that will keep you going all day — maybe even all night. This 234-acre piney-woods park, 8 miles out of Kaunakakai, doesn’t look like much until you get out of the car and take a hike, which literally puts you between a rock and a hard place. Go right, and you end up on the edge of Molokai’s magnificent sea cliffs, with its panoramic view of the well-known Kalaupapa leper colony; go left, and you come face to face with a stone phallus. If you have no plans to scale the cliffs by mule or on foot, the Kalaupapa Lookout is the only place from which to see the former place of exile. The trail is marked, and historic photos and interpretive signs will explain what you’re seeing. The Purdys have made macadamia-nut buying an entertainment event, offering tours of the homestead and giving lively demonstrations of nutshell-cracking in the shade of their towering trees. The short tour of the 70-year-old nut farm explains the growth, bearing, harvesting, and shelling processes. Halawa Beach Park is actually made up of two beaches – Kama’alaea Beach (the curved beach on the left) and Kawilli Beach (the rocky, more exposed beach on the right). The two beaches together form a curved bay-type area at this eastern end of the island. Both beaches are usually calm in the summer. However, the winter months bring large waves and this becomes an excellent surfing beach. Hale’o Lono Beach is next to the man-made Hale’o Lono Harbor, site of the Molokai to O’ahu Outrigger Competition. This beach is small and remote. All the land leading to the beach and harbor is owned by the Molokai Ranch but there is a dirt road that allows public access to the area. In ancient times there was a heiau (temple) located in the area dedicated to the god, Lono. Hence, the naming of the beach and harbor “House of Lono”. This palm lined beach park is one of the prettiest along the Halawa Valley Drive and possibly in all of Molokai. The water is shallow and protected inside the reef. Perfect area for swimming, wading or snorkeling if there is no surf. One of the longest and finest beaches in the Hawaiian Islands. This beach extends over three miles of coastline and is more than 300 yards wide. Here you’ll find campsites, indoor and outdoor showers, as well as picnic and restroom facilities. What you won’t find is a lot of foot traffic. There’s plenty of space to enjoy a beautiful view of Oahu. Over the Kaiwi Channel, just past Leahi (Diamond Head), is Waikiki, which actually took sand from Papohaku years ago to help build up its own shores. Two small beaches make up this natural harbor cove. The first area encountered after parking is more muddy and less hospitable. 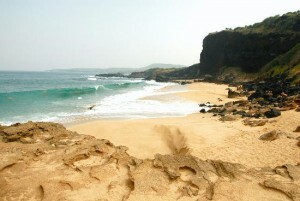 Walk a little further to the east to see the more sandy crescent-shaped beach. Here the water is clearer with a more sandy bottom. The area provides beautiful views of the coastline. The beaches are usually deserted, even in the summer months. Molokai’s weather is warm year round with very little variance between summer and winter. Molokai has a wide range of climates. West Molokai is hilly and dry. East Molokai is mountainous with humid, cool rainforests. The central plains of Hoolehua are dry. The water temperature in near-shore waters is between 77 degrees F and 80 degrees F. There really isn’t a rainy season. Some mountainous regions receive more rainfall between November and March, most of which is brief showers.